If there's one thing that still makes my boy happy, it's elephants. And thanks to some awesome friends, we have a whole new variety of elephant picks and forks to decorate his lunches. This one is only a small sampling of our elephant entourage, but it does make me smile. 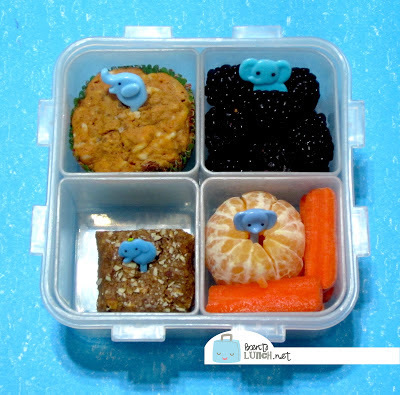 Mr. Ben has a chili cornbread muffin from our freezer stash, blackberries (also from the freezer), a cutie orange carrots, and a Van's Cranberry-Almond gluten-free snack bar cut in half to fit the box. It's decorated with his elephant picks, and tucked into a 4-square Lock & Lock box. The elephant in the blackberries looks like it's peeking out of the brush. Cute!